Thymosin β4 is an actin-sequestering peptide that modulates inflammation and healing in different tissues. It plays a major role in angiogenesis and tumor metastasis. The protein is also involved in cell proliferation, migration, and differentiation. This gene escapes X inactivation and has a homolog on chromosome Y (TMSB4Y). Beta thymosins are a family of proteins which have in common a sequence of about 40 amino acids similar to the small protein thymosin β4. They are found almost exclusively in multicellular animals. 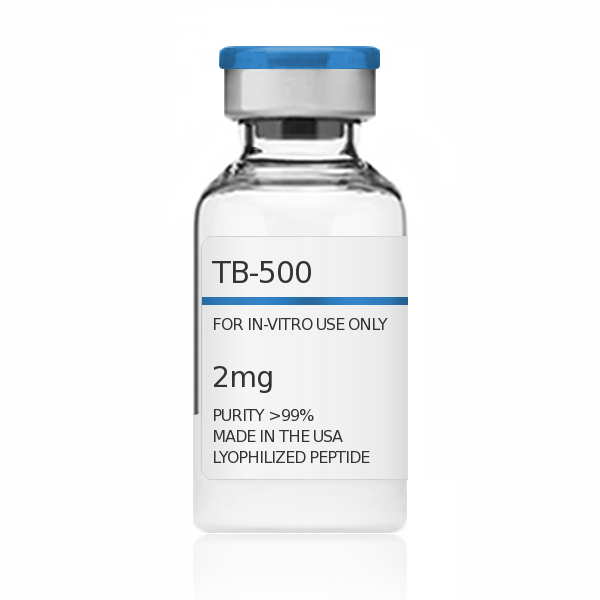 GHPeptides™ TB-500 (Thymosin Beta-4) has a peptide purity level that exceeds 99.0% as determined by HPLC. This peptide was synthesized with no additives and is supplied as a white lyophilized (freeze-dried) powder. It is recommended to reconstitute the lyophilized TB-500 (Thymosin Beta-4) in sterile water, which can then be further diluted in other aqueous solutions. Lyophilized TB-500 (Thymosin Beta-4) although stable at room temperature for 3-4 weeks, should be stored desiccated below -18°C. Upon reconstitution, TB-500 (Thymosin Beta-4) should be stored at 4°C out of direct light for between 10-14 days and for future use below -18°C. Prevent repeated freeze-thaw cycles.